When you love a song, you put it on repeat. It’s just so good; you want to keep listening to it. Eventually though, the infatuation wears off, right? So you find a new song to jam to. That other song is still good, it’s just not on constant rotation. And that’s okay. Just like that song, the food you eat is likely on repeat. It’s easy to make, it’s familiar and you like it. But it also gets boring after a while. And when it comes to eating, boring just isn’t worth it. That’s why you’ve got to take things off repeat! Find new recipes to love and enjoy. That way eating stays fun, just like your music! And I’ve got a few tips to help you take things off repeat! Tip 1: Turn up the Meal Planning Beat! Vow at least once a week to choose 1 new recipe from a reliable source. Pull out that cookbook, a new issue of your favorite food magazine, or call your mom! The goal here is to find a new recipe that looks or sounds delicious, but is also approachable. You’ll be surprised how much fun you’ll have trying something new. Tip 2: Swap something in the recipe. This sounds super scary, especially if you don’t love to cook, but I think you’ll discover that recipes aren’t rules, they’re suggestions. So take some free reign and have fun! Let’s say you’ve got a recipe for spaghetti and meatballs. Instead of making your meatballs with ground beef, try using half lean ground pork and half lean ground turkey. Or add a chopped bell pepper to the sauce. Think about foods you love and see if you can incorporate them into recipe favorites! Tip 3: Sit down and think. What do I mean? I mean sit down, pull out a pen and paper and write down the foods you always eat, the foods you sometimes eat and the foods you never eat. Then, when it comes to finding recipes or building your grocery list, choose 1 or 2 items from the “sometimes” and “never” categories. This way you’ll be finding something new to put into your meal planning rotation! Tip 4: Ask the grocery store employees what’s fresh and awesome. It’s okay to sometimes stray from your grocery list. Especially if you know you want to try this tip! The employees at the grocery store are an amazing resource! They know what’s fresh, in-season and delicious. Just like you ask a waiter at the restaurant, “what’s good here,” you can do the same thing with the produce guy or the meat gal! Have them steer you to the awesome food that you shouldn’t miss. We love this encouragement from Sara to add variety to your meal plan! We can all get stuck in ruts and all it takes is someone reminding us to mix it up and we’re ready to make some adjustments! Swapping up your meal plan with new recipes, viewing what you frequently plan, and making ingredient swaps can be done easily within Plan to Eat and we want to share what features we have to make this easier for you! 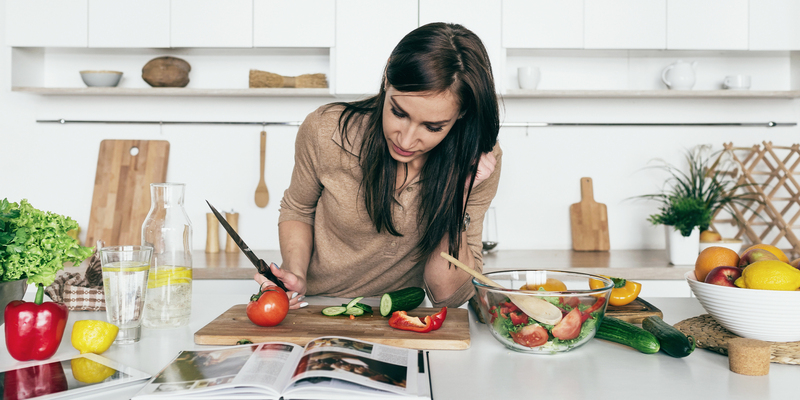 Install our Recipe Clipper to find and save new recipes! This tool allows you to import new recipes from around the web and immediately add them to your Recipe Book! 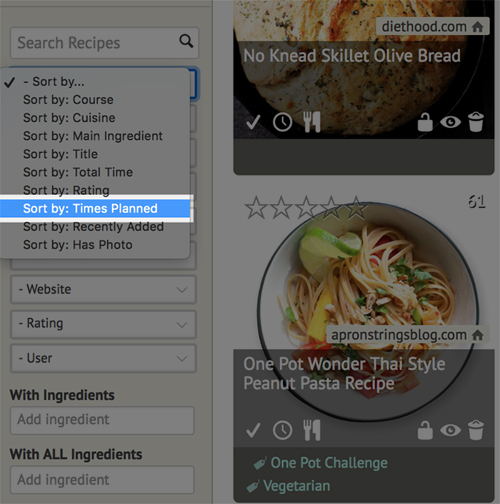 This streamlines the chore of finding new recipes from a plethora of sources. Once you find a new recipe, via search engines or Pinterest, you can import it and have it on your meal planner in minutes! Using this filter will show you recipes from the most planned to the least. This will give you a fairly accurate picture of your family favorites and recipes you plan often. When you scroll down further in this list, you will see recipes you have pinned but NEVER planned! Use the Queue to save recipes that catch your eye. When you find recipes in your recipe book, you can easily add them to your Queue. This is a holding section for recipes that you want to plan this week or in the weeks to come. On each recipe, you’ll see a “checkmark” icon. Press this and your recipe is added to the queue. We love this feature, because it allows you to cull down your recipes to just a few you would like to plan soon. Less overwhelm in planning is always a good thing! Add notes to your ingredients to help make swaps! 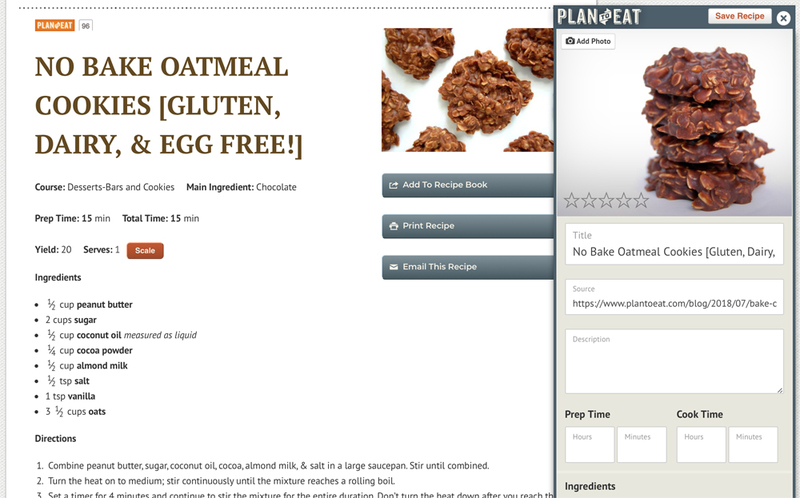 You can add notes into your recipes to help give yourself suggestions for alternate ingredients. Simply open a recipe, click to edit, and then add your notes into the Notes section located to the far right of the ingredient name. Just like in Sara’s example, make a note to use ground turkey and pork instead of ground beef if you’re trying to mix up your proteins! Have a recipe that calls for sour cream? Make a swap and add a note to use greek yogurt! Notes appear on your Shopping List with the planned ingredient, which makes it easy to remember these ideas when you’re shopping, without changing the original recipes! Your Planner stores all your meal plans for all time. Want to see what you commonly plan? Take a look at your Planner! This includes all your planned recipes, notes and ingredients (unless you have removed them)! You can see what you are commonly eating and allow you to make those changes that Sara mentioned. Notice that you eat broccoli, quinoa, and chicken frequently? Great. Swap these for different colorful veggies, new grain, a different protein on this weeks meal plan! Your changes can be just that easy! You can use the arrows at the top of your planner to scroll to previous months or weeks!